After a pretty long development “sprint”, Daily Optimiser 3.0 has finally hit the App Store. Apart from lots of under the cover changes and UI improvements, the big news is that the app - previously iPad only - is now available for the iPhone. 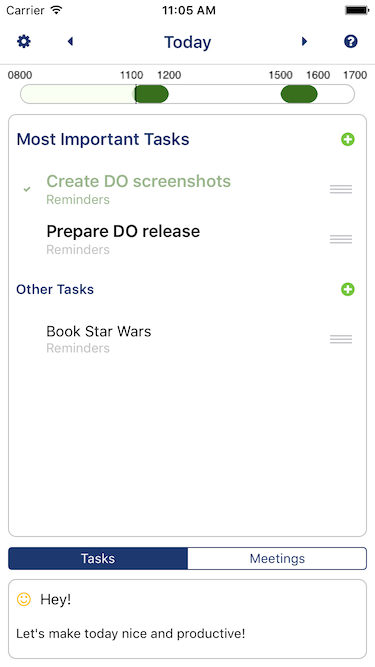 The reason it took us so long to release an iPhone version is we always assumed one of the key features of the app is the ability to see both your task list and meetings in one view. However after a few UX experiments it turns out - not for the first time - I was completely wrong! Having a quick way of switching between the 2 lists is very useful, and the visible timeline pulls together the two views in “task mode” nicely. One thing I didn’t solve in this version is a reliable way to sync which reminders are “most important tasks” in the cloud. I tried using Apple’s CloudKit, but this proved wholly unreliable in the way I was using it. Unfortunately I had to pull the sync feature from this release, but will almost certainly revisit this topic in later releases. Be interesting how this pans out, whether the (hopefully bigger installed base we’ll get for a free app make up for lost revenue). I’ve got another idea for an interesting app, and I’m very much looking forward to tackling some new problems for a while.